Wave Light Games came virtually out of nowhere with the excellent tactical RPG Demon’s Rise ($7.99) a couple of years ago. Perhaps more impressively, the small developer updated the game frequently, responding to player feedback to hammer out many of the game’s dents and rough edges. All of that work paid off when Demon’s Rise 2 ($7.99) was able to launch last year in a much more polished form than its predecessor. Naturally, that game got more than a few updates as well. One problem that sequel faced was that the original game was updated so often, the sequel had trouble distinguishing itself, an issue that likely would have afflicted a third Demon’s Rise had that been Wave Light’s next project. Fortunately instead of doing that, Wave Light has decided to try a new flavor of TRPG. Strike Team Hydra ($7.99) tackles the other popular theme that the genre likes to indulge in: slightly sci-fi alien-busting. The particular strain of sci-fi it’s aiming for in terms of theme is more XCOM than Warhammer 40K, and I’m alright with that because we’re going to have a pretty big vacancy in that area quite soon. But that’s just the bare surface of the game, of course. The nuts and bolts aren’t too far from what we saw in the Demon’s Rise games, so don’t come into this expecting base management, research, and all of that stuff. This is a meat-and-potatoes TRPG through and through, with 28 story missions and another 20 optional side missions. The only thing you can do between those missions is to go shopping. That’s not to say that Strike Team Hydra doesn’t find ways to stand apart from its fantasy-based older siblings, though. Just on a basic level, you’re looking at a far greater emphasis on ranged combat as opposed to the melee-heavy builds most characters in Demon’s Rise had. That calls for very different tactics, with cover being even more important here than it already was in the previous games. You still get to choose a team of six characters to make up your team, but you won’t find any of the off-the-wall choices that characterized Demon’s Rise here. About the strangest thing you can pick is a little quadrupedal tank called the S.P.I.D.R., a cute nod to the literal walking cannon found in the other games. The rest of the crew are humans, or at least humanoid. Of course, appearance has little to do with their abilities. Each of them has their own starting stats, equipment restrictions, and special abilities. In battle, things work more or less as they did before. Each turn allows you to move and perform actions with each character according to how many action points they have. Attacking, moving, and using special commands all come out of the same pool of points this time, so you have to decide carefully what you want to do with each turn. As before, cover and morale play important roles. Hiding behind objects and barricades is an essential tactic that has a bigger impact than a lot of beginning players might realize. As for morale, a panicked unit will incur penalties that make them almost useless until they regain their composure. On the other side, a unit that is feeling pretty high about themselves gets some nice bonuses. Morale isn’t just based on your health, so you need to take into account things like your group formation and such to take best advantage of it. There is one new mechanic to consider. You can now use suppression fire to keep enemies from moving, giving you the chance to stick them with a grenade or just to keep them from charging in and wrecking your team. Thematically, it fits the game quite well so I’m glad to see it in. There are also more interactive elements in the stages. Force fields, tachyon fields, and gun turrets are all used to coax you into strategies you might otherwise not attempt. The turrets are especially fun to mess around with. A highly welcome option to adjust the game’s speed means that you don’t have to wait any longer than you want to for the enemies to take their turns. On the whole, battles seem to move at a quicker pace than they did Wave Light’s previous games. That isn’t to say that they aren’t challenging. Depending on the difficulty level you select, you’ll either find the game to be a gentle cruise or hard as nails. I appreciate that the developer has provided players with the option to choose what’s best for their comfort. 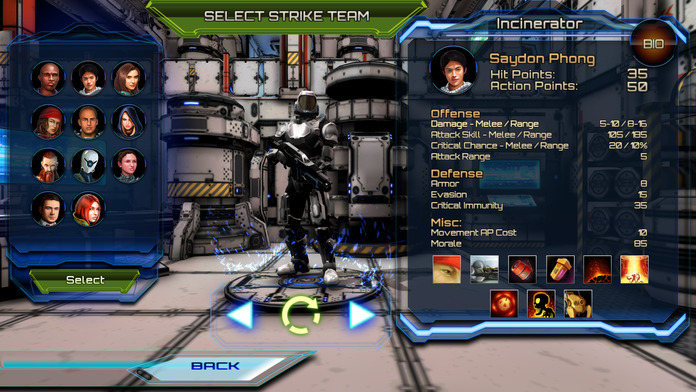 When Strike Team Hydra first launched, its UI was in somewhat rough shape. It hasn’t been that long since the game released, but the developer has already issued a few updates that have greatly improved matters. It’s a lot more slick and easier to use than the set-up in the Demon’s Rise games, to the point that I’d love to see some of the new features, like being able to see if you can attack after moving before you make your move, ported back into those games. It’s still a little fussy with certain buttons and laggier than you might expect in some situations, but on the whole it’s fairly solid now. One minor annoyance comes from the larger presence of walls in the environments. You can adjust the camera to your liking, but it can be hard to find a good angle at times. Apparently, the next update will address this problem by letting you see through the walls if your characters are behind them, but for now, it’s an issue. 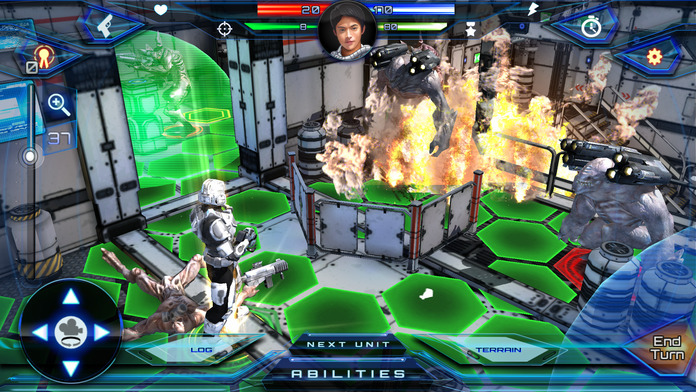 As in Wave Light’s previous games, you’ll have to battle your way through a variety of story missions set across a number of different maps. Instead of treasure being scattered around the maps, power-ups are more the order of the day. You’ll still find some loot now and then, however, and it’s as good as ever. Plenty of modifiers and randomization, and if you can’t find something you like, you can sell it at the shop between levels and buy something more to your liking. You can also take the opportunity to try out some of the 20 special missions while you’re taking a break. If you happen to feel like your levels or general load-out are falling behind, the special missions are a good way to beef up. You can also swap out team members between battles so that you can try out all of the different kinds of characters without needing multiple save files. Now, if you happen to want those anyway, you’ve got something like thirty different slots to save in. The presentation is also quite good. Given the size of the developer, their TRPGs have always had impressive production values, but it’s even better this time around. Along with the slicker UI, you also get more detailed levels, better animations, and really nice character models. The characters have a little voice acting this time, and while it’s not terribly great on the whole, it does add to the experience. We even get a few simple cut-scenes this time around. The game’s story is as light as ever, so if you’re looking for a strong narrative, you probably won’t be satisfied here. 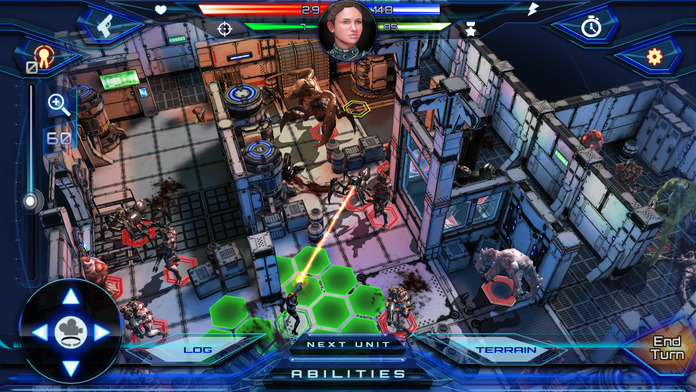 Strike Team Hydra is all about the strategic gameplay packed into a gorgeous wrapper. This particular developer seems to get a little better all the time, and Strike Team Hydra is a good example of that. It’s easily the most playable and refined of Wave Light’s TRPGs, and the change in theme certainly helps to freshen up even the returning elements. It’s not a replacement for the soon-to-be-departed XCOM, but it’s not really trying to be. It’s a straightforward, well-built tactical role-playing experience, one that deserves a spot in the collection of any fan of the genre. One can only hope that two more rise in its place.